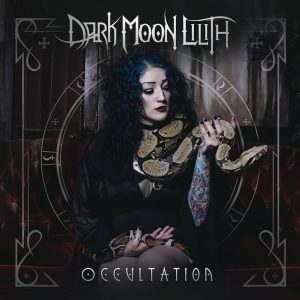 Dark Moon Lilith – Occultation – Album Review | The Ark of Music – The best music in the world…you never knew existed. 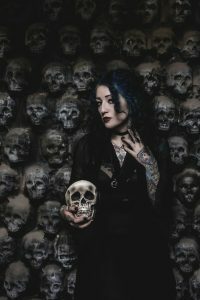 Formed in 2016, at the heart of the Nashville-based, goth-styled, alt-rock band known as Dark Moon Lilith (DML), is a woman named Tara James (a.k.a., Lilith), who’s spent the majority of her life drifting toward this moment. Tara has been writing songs and arranging melodies since the age of eight; and by thirteen years old was fronting in her own all-girl band. A short stint in college, where she studied classical guitar at Drury University, proved to James that school was not copacetic with her moving spirit—prompting a huge move across the world to Australia where she would focus on songwriting for a time. In 2015, with a catalog of songs in hand, Tara moved to Nashville, TN where she would inevitably meet producer & collaborator, Mathew Fulper-Smith. “Dark Moon Lilith is about balancing the light and the dark. Drawing inspiration from 90’s rock legends such as Smashing Pumpkins, Hole, Garbage, and Nirvana, DML’s debut album, Occultation is not exactly what you might assume it to be at first glance. What kind of joy does he ever bring? Would you give up all and everything? An acoustic guitar and James’ vocals (with a touch of reverbed harmony in the background) create a delightfully minimalist intro for the first 2:39 of, World Away. The final two minutes bring in a gentle percussion and electric chords to reveal yet another angsty—yet ambient—tale of lost love. All in all, Dark Moon Lilith’s debut effort, Occultation, offers a solid collection of uncomplicated rock ballads which are far softer and more gentle than Lilith’s image might suggest. What’s more, James is not simply a pretty face and voice. She plays, she composes, and she writes—a refreshing trifecta in a pop-bubblegum culture where it seems to be more and more commonplace for the “artist” to simply show up to the studio once the real work’s already done. We’ll be keeping an eye out for James. BELOW, you can listen to Dark Moon Lilith’s album, Occultation, and connect with their website and social media platforms. Please support Dark Moon Lilith by visiting them online, and playing, downloading, and/or purchasing their music. And, as always, thank you for supporting real music!